Fill pot with the sea water and place on the stove to boil. Be aware, due to the amount of water in the pot and the salt, it may take a while for the water to come to a boil. 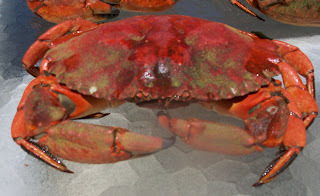 There are two theories about preparing the crab for cooking; the crab can be cracked in half and cleaned before placing in the pot, or the entire crab can be placed into the pot and then cleaned after it's cooked. Either way will work, it's all in your preference for mess. I prefer cooking the whole crab first. Carefully place the crabs in the pot using your tongs. I like really really long ones to avoid getting pinched - my dad is much braver than me! 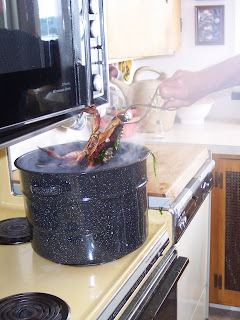 After filling the pot with the crabs, place the lid on and turn the heat down, but still boiling. Timer should be set for 20 minutes. When the crabs are done, run continuous cool water on them until they cool down. 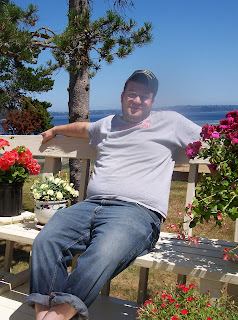 picnic table, it seems to be the easiest way to make clean-up a breeze. Alex and I have determined that effective crab cracking is all in the tools; GOOD crab crackers, and maybe a small hammer as Rock Crab are just a little harder than a dungeness to break open. 2. Remove the triangular-shaped section on the flip-side of the crab and lift away. Should be then easy to gently remove the gills on either side, and wash away the "crab butter" (kind of gross yellow stuff..). Some crab connoisseurs consider this a delicacy, not me. 5. Dig in! Use your fingers, crab picks, crab-crackers or whatever you find to break out the crab meat - YUM! Wonderful to dip in melted butter with garlic and lemon, or simply eat right out of the shell. Here's one of our favorite E-Z appetizers to make! 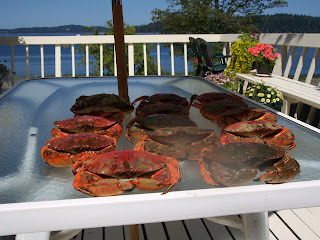 So easy, can be whipped together in about 5 minutes - one of my favorites after fun crabbing afternoons in the San Juan Islands. Spread softened cream cheese on a decorative plate, then layer with cocktail sauce and crab. Serve with your favorite crackers. Guaranteed to be the hit of your next party!